APPAREL FREELANCE DESIGNER: Spring Summer Fashion Forecast “2013” – theme-1 - Contemporary Fashion – Modern styles. There are some themes that will represent the fashion forecast of spring summer 2013.. 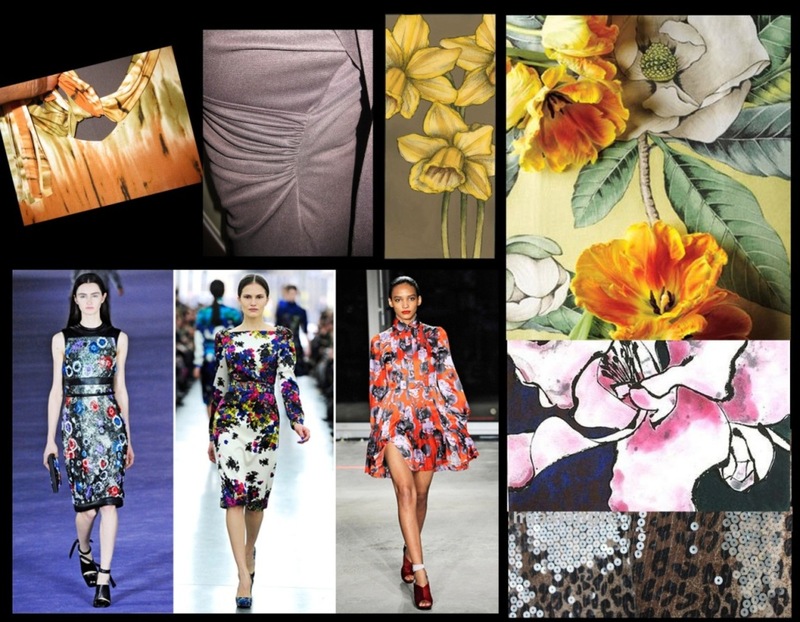 Considering the ideas of mood board – the forecasting styles & it details are followed all over the world.. In mood board - silhouette details and print details – fabric details – embellishments are declared for the fashion followers…. Contemporary Fashion - The existing style or custom, as in clothing again– Garment in current mode – the style of a certain period… The best awarded designers of contemporary fashion are – Rannagill, Satya paul. Rannagill – whose creations are contemporary haute couture stylings for women….. ..
Inspiration – New resurgence – the reappearance of the existing modern styles.. A rebirth or revival – the humanistic revival of art / architecture & fashion.. Fashion is exactly one’s expression, so re-examination of “out of fashion” items & invente new ideas from the existing one. Contemporary fashion equip with adaptable garments, prints, accessories…. Fabric – Brushed cotton; Embellishments – Ethnic Prints, Graphic prints – Embroideries with matte sequins. Silhouette details – multi paneled tank top with some gathering details at one side; Lengthy neck line blouse with elastic waist and bow at neck point, princess line sewn, Flared sweep, little small gatherings at flip flap sleeve hem; Pencil skirt with gatherings at one side; Bustier long tunic with smocking details at side seam of bust part, pockets at front both sides, Flared bottom; Sleeveless collared top with front button placket [Full], Wide sleeve arm hole, front shoulder; Plain scoop neck top with printed scarf attached neck line with contrast binding. Embellishments – Embroideries with matte finish sequins. very thank you pery! but i hav to develop more.. Hope you will also be one of the future perfect designer!